Here's a list of some of our most commonly asked questions. If you can't find an answer, you can always ask us. Is the house suitable for corporate events? Pavilion 2 is the perfect place to host your next corporate retreat. Escape from the pressures and stress of city life to an idyllic and relaxing location, perfect for team-building, conferences or meetings. Is the house suitable for weddings? Pavilion 2 at Broken Head is perfect for an intimate Byron Bay beach wedding. Realise your dream of being married in a private ceremony on a secluded beach. Choose any time from sunrise to sunset for the ceremony then walk back up the path through the beachfront rainforest to your intimate reception at Pavilion 2. Enjoy the benefits of the well-appointed kitchen to celebrate your marriage or alternatively you may prefer to organise caterers. The dining table can be extended to seat up to 20 guests or alternatively you may prefer to serve finger food on the deck, the lawn or the living area. All weddings or functions require the services and attendance of a Pavilion 2 accredited wedding or event planner. How far away is Byron Bay? It's approximately 7 kilometres to the centre of Byron Bay, a kaleidoscope of arts, crafts, restaurants and boutique shopping. Do you have a list of terms and conditions for bookings and stays? Yes! Please see our terms and conditions page here. Is smoking permitted at the property? No, the property is smoke-free and any evidence of smoking will incur an additional cleaning charge. Ballina airport is 20 minutes south. One hour north to Cooloongatta International Airport. Brisbane's Domestic and International Airport is also an easy 2 hour drive north. Limousines can be arranged if required. Pavilions is located on the beachfront at Broken Head. It is approximately 150 metres through the sand dunes to the beach. Can I have a chef at the property? Yes. Chefs are welcome at the property but must be accredited by Pavilion 2. Pavilion 2 has four comfortable bedrooms (two of which interconnect) and three en-suites so the standard bedding configuration sleeps up to 8 guests (King, King, Queen, Queen). However, we offer flexible bedding options available plus one Queen day beds and a single day bed with a trundle so the house can sleep up to 10 guests on request (additional charges will apply, and this must be arranged at the time of booking). 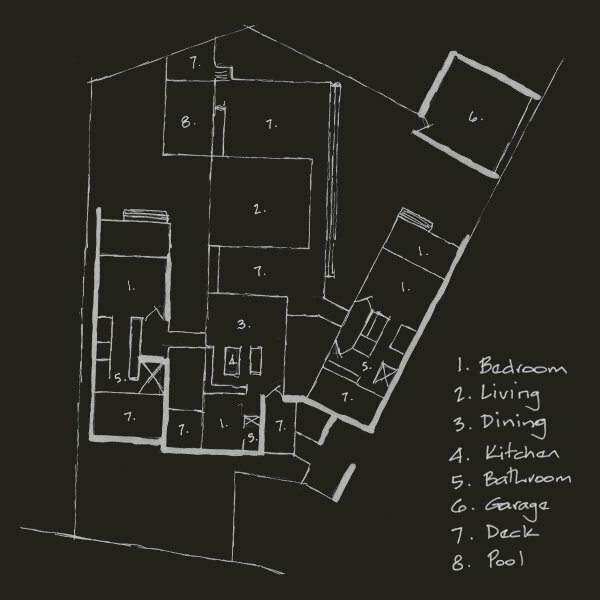 Can I see a floor plan layout? Yes, the property is pet-friendly for dogs. An additional fee of $80 applies. What is the minimum number of nights I can book for? There is normally a 3 or 4 night minimum stay applicable during low season and a 7 night minimum stay applicable during high season, however we do offer occasional promotions throughout the year where these minimum stays may vary. Please ask through our online booking enquiry form or phone us so we can advise you on the best available rate for your stay. Join us on Facebook and Instagram to stay up to date with other offers. A small store is located 400 meters away at the Caravan Park. A neighbourhood shopping centre is approximately two kilometres away at Suffolk Park. This offers virtually everything you require for your stay from a bakery, coffee shop, take-away, convenience store & deli, chemist to a hotel and bottle shop. Are there any discount offers? Yes! We often have great-value offers throughout the year - ask through our online booking enquiry form or call us to ask about the best available rate for your stay. Join us on Facebook and Instagram to stay up to date with other offers. We totally enjoyed our stay at Pavilion 2 with our whole family. The serenity was exceptional and the facilities are second to none. The young ones enjoyed the beautiful beach and the Byron bay shopping. We would strongly recommend this place for a great escape. Accommodation was brilliant, everything was thought of and we didn't need to purchase or bring utensils etc from home. You'll be directed to our booking enquiry. Ask us about your holiday dates and any other requirements.